Busy ghostwriter Richard Gibson is putting the finishing touches to spinner Graeme Swann’s autobiography and is working with fast bowler Jimmy Anderson on another collection of memoirs from within England’s Ashes-winning dressing room. There should be no shortage of interest in either book, although they have a tough act to follow after Gibson’s successful collaboration with larger-than-life commentator David “Bumble” Lloyd, which is due out in paperback shortly after exceeding expectations in hardback sales. Start the Car: The World According to Bumble (HarperSport) has sold more than 32,000 copies at the last count, reflecting the affection in which the Sky Sports commentator and former England coach is held by the cricketing public. Lloyd’s humorous down-to-earth take on matters of cricket and beyond is part of his appeal as a broadcaster and Gibson, a former Press Association cricket reporter now working as a freelance sports writer, did a fine job transferring the Bumble wit to the printed page. 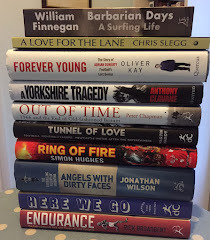 Today’s ultra-professional standards don’t allow England cricketers the freedom off the field their predecessors enjoyed and the scope for outrageous antics of the kind that give ready colour to cricket biographies is reduced as a consequence. But Swann, with a quirky sense of humour and an alternative life as lead singer in a Nottingham pub band, is as big a character as any in the England dressing room, a serious cricketer but one with a penchant for wisecracks and a willingness to play the game with a smile. He will have interesting things to say, no doubt, about his relationship with Kepler Wessels, the earnest South African whose coaching regime at Northamptonshire prompted a disheartened Swann to move to Trent Bridge. And about Duncan Fletcher, an England coach who was never likely to find Swann less than a challenge, particularly when he missed the team bus through oversleeping during his first senior tour. Swann’s account of how a cat trapped underneath the floorboards forced him to make a 3am mercy dash to his local 24-hour Asda -- landing him in court on a drink-drive charge from which he was ultimately cleared -- ought to make entertaining reading too. The Swann story, published by Hodder and Stoughton, is due out in October. Buy Start the Car: The World According to Bumble .